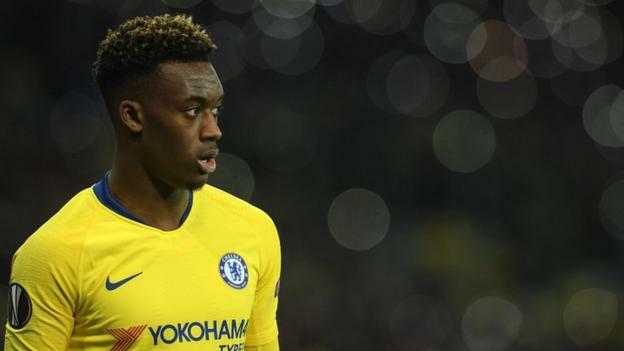 Chelsea have lodged a complaint with Uefa over racist abuse aimed at Callum Hudson-Odoi during the second leg of their Europa League win at Dynamo Kiev. During the last two minutes of the match last Thursday, Hudson-Odoi was understood to be subjected to monkey chants from a group of home fans. The 18-year-old told Cesar Azpilicueta, who reported it to the referee. Chairmen Bruce Buck and club secretary David Barnard also reported it to the Uefa delegate for the match. “We can confirm a report of racist abuse directed at one of our players in the final minutes of the match in Kiev from a small section of home supporters,” a Chelsea statement read. With the matter included in both the referee’s report and being highlighted to Uefa, the governing body is now set to investigate and Chelsea said they would provide full co-operation. BBC Sport has contacted Uefa for further comment. Hudson-Odoi scored in the game, as Chelsea won 5-0 on the night and 8-0 on aggregate to set up a Europa League quarter-final against Slavia Prague.